Showing search results for Never Haters Quotes, Quotations & Sayings 2019. 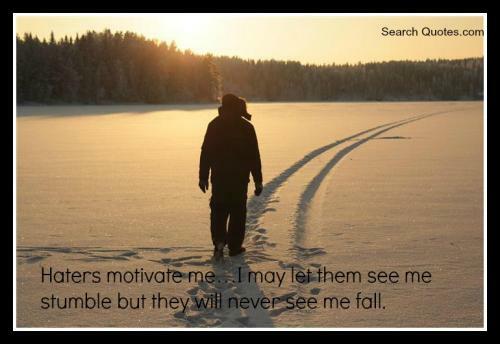 Haters motivate me, I may let them see me stumble but they can never see me fall. Never back down. Always keep your head up to show haters what you're capable of. No matter what, there will always be somebody who will try their hardest to take all that happiness that shines in and out of you; people will hate you even for being good. Keep on shining, because you're doing something right to have haters. Haters will never admit that they secretly desire all that you have and will never work hard to better themselves, they will also never admit that they secretly admire you. Never ever let anyone put you down, because you're beautiful, no matter what anyone says you're worth it and you know you're cared about. So for now laugh at the haters and cry with the lovers, and be who you are. 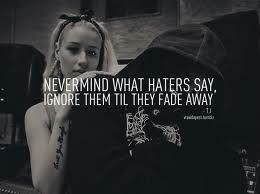 Never mind what haters say, ignore them till they fade away. Haters are like crickets; they make a lot of noise you can hear but you never see them, then you walk right by them and they're quiet. Never explain yourself when haters have already made up their mind. You swear you know me because you know my name but if you really met me you would know the game, drama never ends haters are all the same they smile to your face and spit on your name. No matter the situation, or how much I worry, God never fails to show me it's all going to be okay! Thankful to serve an awesome God!